Pride may be destroying everything you care about! 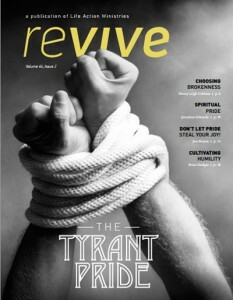 This issue of Revive dives deep into what I believe is the #1 indicator of maturity: an attitude of humility. Yet, most of our world glorifies pride, and even celebrates its ability to make decisions apart from God (or anyone else). But we all know where pride leads – to destruction, as the Proverbs teach so clearly. Sadly, I haven’t just noticed pride in the world. I notice pride in the Church. And I even notice it boiling up in me. That’s why its so important that we address this topic head-on, that we get honest before God and each other, and look to the Bible for wisdom. I pray that this issue will help you focus your attention on the “right kind of pride” (yes, there is such a thing, as you’ll discover in this magazine!) while helping you cast off the ugly burden of selfish pride. As Jon Bloom writes in one of the included articles, “Death to the tyrant pride!” And then, on to the freedom and blessing of a humble, God-oriented lifestyle. Let me know what you think of this one, my friends. And what do you think of the “Making It Personal” test near the end?